The Liefkenshoek railway link project consisted in the construction of a direct railway link between the left and right banks of the River Scheldt. The new railway link directly connects the left bank with the railway infrastructure on the right bank (Line 11 and the Antwerpen Noord marshalling yard) without trains having to leave the port area. This freight link must provide a solution for the expected increase of rail freight traffic to and from the port of Antwerp. The developments on the left bank, more specifically the commissioning of Deurganck Dock, are one reason. At the same time, policy-makers are also striving to increase the share of rail transport in freight transport. Without the Liefkenshoek railway link the additional freight traffic that would be generated as a result would have an unacceptable impact on train traffic on the current route via the Antwerp-Ghent railway line (Line 59, passenger traffic). The construction of this infrastructure in the port will make it possible to increase the share of rail freight as well as reducing the risk of structural traffic congestion in the region around Antwerp. 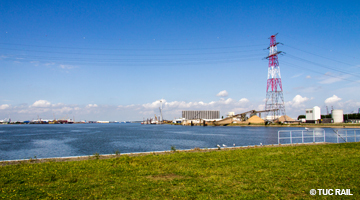 The railway link consists of a new 16.2-km double-track railroad which passes under three waterways: the Waasland Canal on the left bank, the River Scheldt and Kanaal Dock on the right bank. As a result half of the new line runs underground, in tunnels. The existing Beveren Tunnel (which had not been operated till then) will be used to pass under the Waasland Canal. For the most part the railway line will be bundled with the existing road infrastructure. railway and tunnel equipment work. Infrabel worked with a public private partnership for the financing of the civil engineering works. After a tender procedure (negotiated procedure) a DBFM (Design, Build, Finance and Maintain) contract was concluded with the contractor Locorail. Locorail is consequently responsible for the design, the building and the financing of the civil engineering works (including the fire safety installations in the tunnels) and for their maintenance over a 38-year period. The equipment works (tracks, overhead lines, signalling installations, power supply and tunnel equipment works) are not included in this DBFM order. the study and the execution of the railway equipment works (tracks, overhead lines, cables and signalling installations, power supply) and the installation of the tunnel equipment. Click here to view pictures of the Access to Antwerp port.